Boeing and Air New Zealand have finalized an order for two additional 787-9 Dreamliners, valued at $514 million at current list prices. 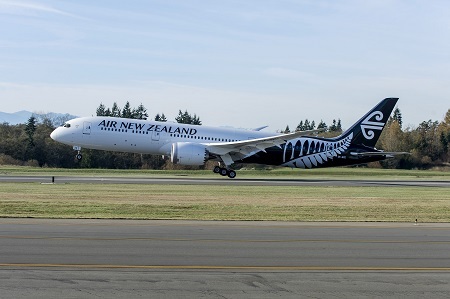 The order, booked in 2014, comes six months after Air New Zealand celebrated the first 787-9 delivery in July. This order will eventually increase the airline’s fleet to a total of 12 787-9s, which will operate alongside 15 777-200ERs (Extended Range) and 777-300ERs. Air New Zealand is the launch customer of the 787-9 and currently operates three of the aircraft in its fleet. Including today’s announcement, the airline now has nine unfilled 787-9s on order. To date, 58 customers around the world have ordered 1,071 787s.